This review is part of a virtual book tour organized by Goddess Fish Promotions, and the author is giving away a Fallen Soldier T-Shirt (red, size TBD)to one randomly drawn commenter during the tour -- so make sure you leave a comment! Also if you visit the other stops on her tour and comment, your chances of winning increase. All the stops on her tour are here. The second is the woman he left behind, now a widow with a 4-year-old son - and his new prosthetist (artificial limb maker). 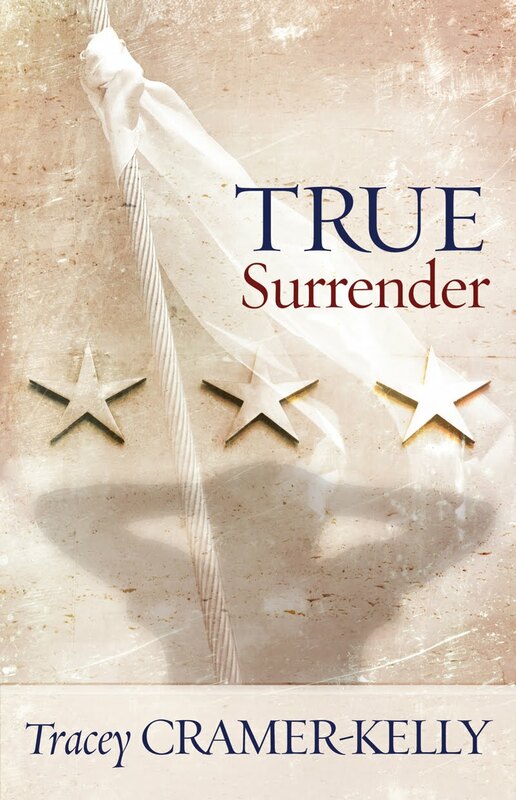 This story captures the deep emotions of a soldier who had been tortured and maimed by the enemy in Afganistan. His feelings and thoughts are sensitively shown. It was sweetly romantic yet sensual. This is a tender romance which lets the reader see how the war affected his thinking, feeling and acting, in regards to relationships with others. He suffers from anger, sadness, the loss of a leg, the feeling of helplessness, and frustration along with the sorrow and guilt about the harm that had been done to his companions. The heroine is caring, understanding and very patient with this soldier and shows how important this is to his recovery. 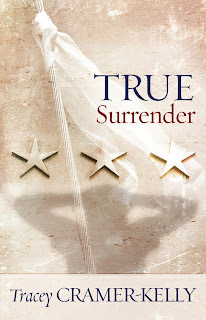 True Surrender follows his recovery -- both mental and physical -- and also shows how he finds the party who was responsible for his capture and torture. How he deals with his feelings of betrayal and how he overcomes his anger was wonderful to read. I really enjoyed the story which helped me understand what some of our soldiers are dealing with in today's world. The only complaint I have about the story was the conclusion and resolution of the situation which had caused his capture and the death of others. I felt cheated because I didn’t see how it was worked out in real time. Instead I only found a few sentences that dealt with the conclusion. All in all, however, I enjoyed the story and the people in it. I wouldn't have been unhappy with the ending if I hadn't been so completely invested in the characters, which shows the skill of the author. It is a very timely novel that's well worth reading, and I'd definitely be interested in reading more from Tracey Cramer-Kelly. FTC Disclaimer: I received this eBook from Goddess Fish Promotions in exchange for my honest review. 1. I am the One, the all and the only. I live in the Pendleton as surely as I live everywhere. I am the Pendleton’s history and its destiny. The building is my place of conception, my monument, my killing ground. . . .
Dean Koontz transcends all expectations as he takes readers on a gripping journey to a place where nightmare visions become real—and where a group of singular individuals hold the key to humanity’s destiny. Welcome to 77 Shadow Street. TO BE RELEASED 12/27. 2. All of The Dark Tower series (actually, that's seven books... but I'll just count them as one.) 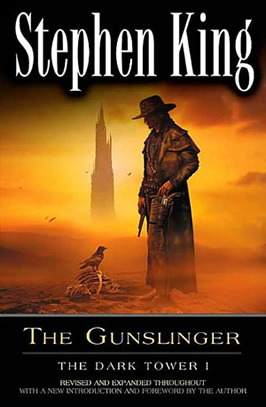 I want to re-read the books I've read already and read the couple I've not yet read in preparation for The Dark Tower: The Wind Through the Keyhole is coming out in March!! 3. I'm currently reading through this series and hope to make it to this latest book this winter. 4. One of my favorite authors, YA book, the start of a new series, and time traveling--what's not to like? 5. Yep, another one by Stephen King. It's already out and I'm on the waiting list for it. Gotta love the "liberry"!! 6. I found a series on Netflix that I'm really enjoying, The Murdoch Mysteries. Maureen Jennings wrote the the books the series is based on, and I'd like to read them this winter as well. 7. 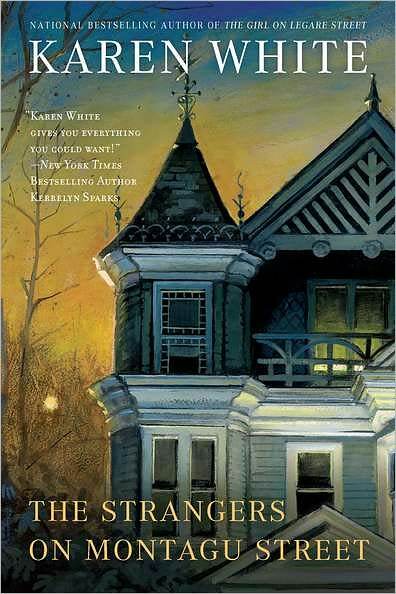 This is the third book of Karen White's Tradd Street books--and I can't wait to read it!! Winter is not only good for reading NEW books like the ones above--it's also good for rereading some old favorites. I don't normally read books again, but there are a few that I try to read every year--and normally it's during the winter when it's too miserable to get out and about. 8. I love this series--and the movie versions are pretty darn good too. 9. This is a short little book, but a charming one. 10. Another series I really enjoy--and each time I read it, I find something new. And...there you have it... ten books/series I want to read or reread this winter. Can't wait to check out everyone else's list...and see what else I can add to my own!! 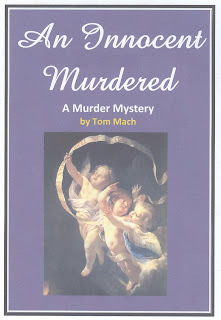 Today we're welcoming author Tom Mach to the blog on his tour with Goddess Fish Promotions for the mystery novel, "An Innocent Murdered". Remember, Tom is giving away a $50 Amazon gift card to the commenter that Tom feels leaves the best comment during the tour. So comment today AND follow his tour (just click on the banner above) -- the more you read and comment, the better your odds of winning. You could be introduced to a great new author AND earn a GC to buy more books. It's win-win. I see you’re self-published. What are some of the pros and cons of doing so? 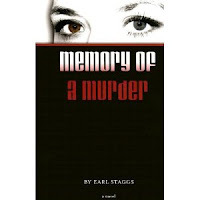 Actually, my paperback books were published by a small press which I happen to own, but my eBooks, including An Innocent Murdered, were self-published. Let me first discuss one of the negatives of self-publishing. A huge negative is the fact that the vast majority of newspapers and national magazines refuse to run any features on new books that are self-published. I believe their rationale is that if the book is self-published it doesn’t have the persona and high quality of a book published by a mainstream press. This is such an elitist and erroneous viewpoint. Most self-published authors, including myself, take great care in writing their books with a great deal of skill and go through the trouble of having their books professionally edited. Yes, there are some sleazy, poorly-written self-published books out there, but I am sure they are in the minority. With that being said, there are some powerful reasons why self-publishing is the way to go for authors. Publishers are cutting back on staff and are turning down novels written by first-time authors. Authors who are lucky to get an agent can wait months before a mainstream publisher is found and then, they may have to wait at least a year or more before the novel sees print. On top of that, the author receives a tiny percentage of the sales and is expected to do most of the marketing and promotion himself. With self-publishing, an author does not have to wait long and can have his or her book out in a couple of months. He still has to do his own promotion (just like a first-time author published by the mainstream press) and can bypass those prejudiced newspaper and magazine editors and promotes his/her own books by other means. I sold over 3,500 copies of my paperback book Sissy!, largely through talks, book reviews, and word of mouth. Another reason for self-publishing is that it gives you freedom over cover design and book layout. You have very little or no control over what happens to your book if a mainstream publisher handles it. Also, don’t forget you get to keep all the profits from self-publishing, although for me that’s not important. I’m not interested in making money, just interested in sharing my stories with others. Where did the idea for “An Innocent Murdered” come from? Do you have any interesting writing habits or quirks? Unfortunately, I do not have a regimen where I type X number of pages a day at a specific time of the day. I wish I had that sort of structured life. I tend to write whenever I get the urge to write (which is frequently) and when I get an idea for a scene that I must put down on paper as soon as possible. One quirk I remember having was when I wrote my novel Advent. I typed almost the entire novel while listening to Dvorak’s New World Symphony. The music put me into another mind space and I found my novel about the future of our world coming alive for me. Give us some insight into normal day writing. I get up out of bed at 5 am because I can’t sleep. I stumble over to my computer, turn on the light, and see what I’ve written so far. I picture the novel in my head. Type until I get tired. Wake up the wife. Go out for coffee, but think about my novel as my wife discusses her agenda for the day. Have lunch while thinking about my novel. Take a nap. Write more on my novel. Daydream. Check my Facebook and Twitter. Think about my novel again and make some notes. Have dinner and think about my novel. Then watch a little TV and stop thinking about my novel until the next morning. Do you have anything new that you’re working on? If so, please tell us about it. I’m working on two novels simultaneously. While I don’t want to be specific on what they are about (since, as you know, there are enemy spies out there wanting to steal my idea) I can say that one is a historical novel about a late 19th-century woman being hunted down by a deranged killer while the other one is about three men from different cultural background who want to seize the most important Christian relic of all time in order to suit their own purposes. Sounds fascinating! Thanks for visiting with us today, Tom! 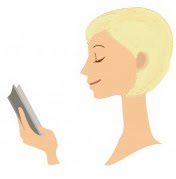 Would you share the blurb and an excerpt of your book before you go? 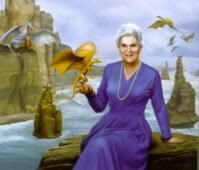 I was saddened to see the reports that the grand dame of SFF writing, Anne McCaffrey, died yesterday. She was instrumental in making me the voracious reader I am today. 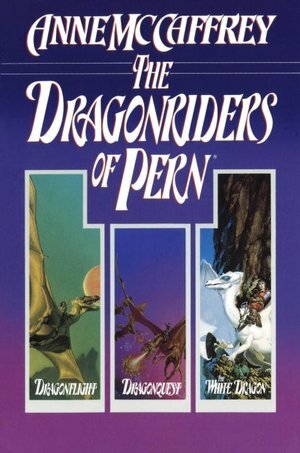 I gobbled up her Dragonriders of Pern books, again and again. I imagined that I would impress a dragon one day, had an artist friend make me a life-sized cardboard fire lizard that I carried around as though it was real. My first childhood crush was on F'Lar ... alpha male personified. While I haven't read many of her later books written with and then by her son, Todd, the original 20 or so are in my library on my keeper shelf, and I enjoy them again and again. R.I.P. Ms. McCaffrey... you will be missed. 1. Stephen King: I love this man's writing! He's definitely on my auto-read list. 2. 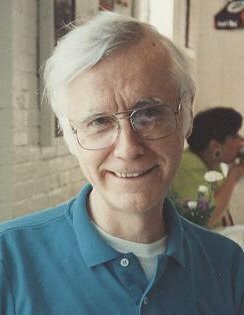 Dean Koontz: I especially like his Odd Thomas series, but he's also on my auto-read list. 3. Alan Bradley--especially if he brings Flavia! The only problem is... I've read all he has out right now... and I'm already ready for the next one! 5. Mark Twain. I think it would be great to just sit and listen to him and his stories. 6. Charles Dickens. Between Mr. Dickens and Ms. Austen, I could really enjoy the discussions of class and life in 19th century England. 7. Maeve Binchy. I want to live in a Maeve Binchy novel. 'Nuff Said. 8. Martha Grimes. 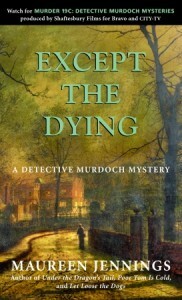 First, congratulations to Ms. Grimes on being named the 2012 Grand Master by the Mystery Writers of America. Another auto-read for ALL her series. 9. Louise Penny. 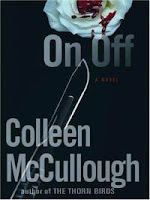 This is a new author to me, but I'm thoroughly enjoying her Three Pines series. 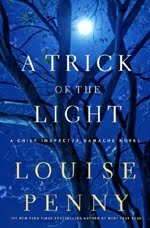 If you like mysteries, and haven't yet checked her out, I recommend you do! 10. I would be remiss if I didn't include the first author I remember feeling a kinship with, Lucy Maud Montgomery. Her Anne of Green Gables series thrilled my young soul when I received them as a Christmas present umpteen-thirty years ago. I would love to include more authors that have meant a lot to me over the years: Louise May Alcott, Arther Conan Doyle, Ray Bradbury, Isaac Asimov,... the list could go on forever. Wedding planner Cassandra Hanley is in the business of making other people's dreams come true. But for some reason, whenever she meets a potential mate of her own, she finds herself telling little (and not so little) white lies. She's not trying to sabotage her relationships on purpose: as a people pleaser, she just naturally tells men what she thinks they want to hear. When Cassandra meets Nick, she's determined to be herself this time—until she learns he abhors weddings. So she recasts herself as an advertising exec, and now she's scrambling to cover up the lie...with more lies. Into the tangled web wanders Cassandra's college sweetheart, Kevin. Kevin, the one man who knows the real Cassandra, and loves her anyway. Could he have been The One all along? 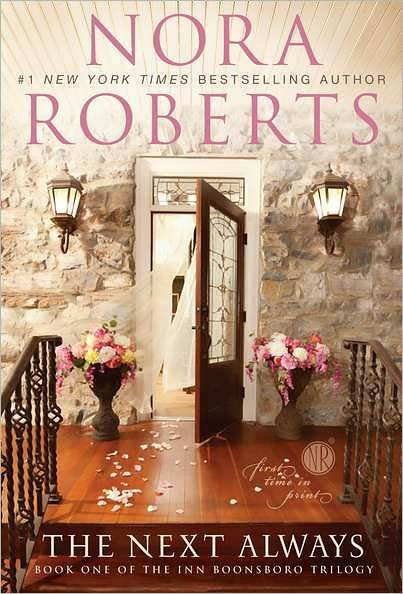 Torn between the past and the present, Cassandra is about to learn that you can't plan the perfect life the way you can plan the perfect wedding. I didn’t think I would enjoy this book as much as I did. As you follow the heroine through the story plot, you also follow her three friends, her family and ex-boyfriend. You get to know them all so well that, as you read, it is as though you are watching a movie. The author's descriptive writing showed me everything so clearly. It is a delightful story and fun to read. 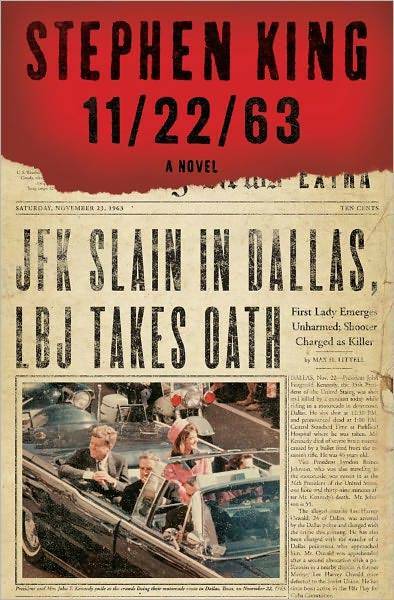 I gulped it down in one long sitting (it's not a short book -- but I couldn't put it down). The main theme is, of course, relationships. Not only hers, but the others in the story. Her problem is that she lies constantly to make herself what she thinks the hero wants her to be. I giggled and laughed as I read about her misadventures as she tried to get herself out of the dilemma she caused. The story is not as predictable as you might think, and so I had to keep reading to find out if she ended up with who I knew was Mr. Right. I also wanted her friends to end up with their own Mr. Right. You will have to read it to find out how it ended. I thoroughly enjoyed this story and hope the author releases something again soon. She made me a fan with this delightful tale. I'd highly recommend it to all readers, especially to women who didn’t marry early in life, of those looking again in their 30’s. Lots of fun. 1. 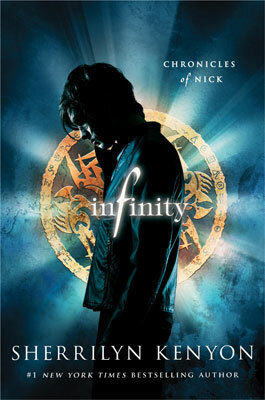 Infinity by Sherrilyn Kenyon. I didn't even remember having this book ON my shelf, but I can't have had it THAT long, since it just came out last year. I've pulled it down now, though. It looks GOOD!! I think I got it at a librarian's conference last year where I had the honor to meet Sherrilyn and have lunch with her (she's a doll, btw). 3. 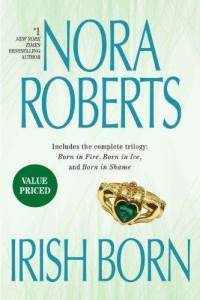 Irish Born by Nora Roberts. This was a gift, not because of the author, but because I'm a lover of all things Irish. One day, I'll get around to reading this one as well. 5. Game of Thrones by George R.R. Martin. 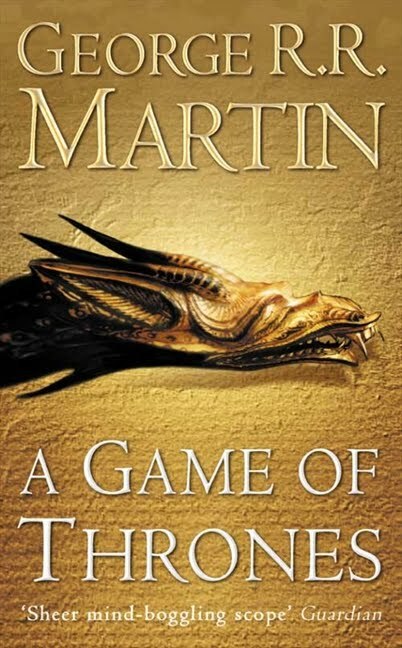 I got this book, intending to read the series before watching it on television... I've not had the time to read OR watch the show!! 6. 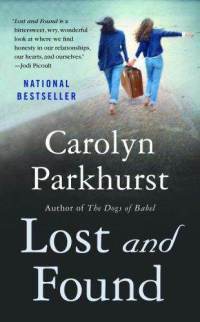 Lost and Found by Carolyn Parkhurst. 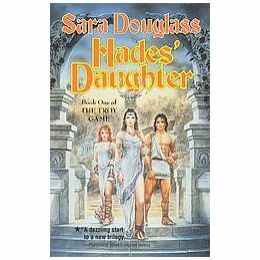 I LOVED the cover of this book. The back cover blurb caught my attention as well. 7. On Off by Colleen McCullough. I loved The Thorn Birds, so when I had the chance to grab another book by the same author, I couldn't turn it down. 9. This Body of Death by Elizabeth George. 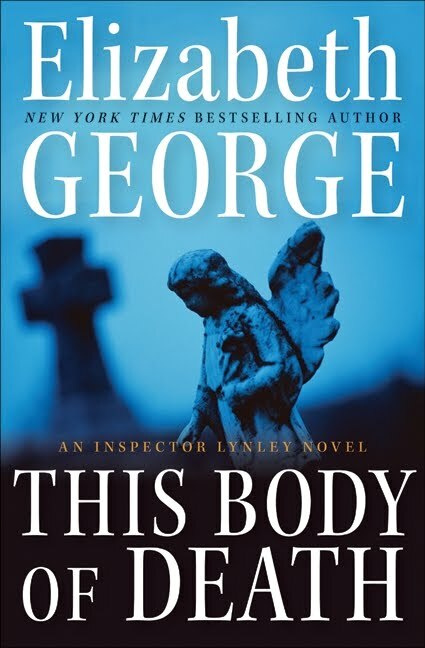 I LOVE Inspector Lynley...another book that is NOT going back on my shelf, but being added to the ever-growing pile next to my bed. I need to do nothing but read for the rest of the year... do you suppose my boss will mind?? Do you have any other books I can add to my list? 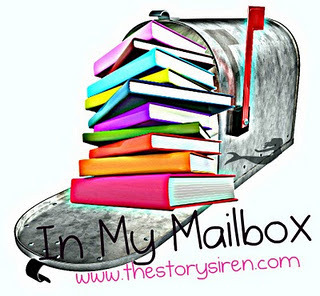 In My Mailbox: Mysteries and Romance and YA, oh my! This is my first In My Mailbox, and I'll let you know up front that I read a lot of small publisher books. I love the NYT Bestsellers ... I do! But small press books are a great place to find a gem that's outside the norm (and not break the bank doing it). I'm also quite eclectic, so you'll find a variety of genres popping up in my posts and in my reviews. Father O'Fallon has been murdered, and police officer Jacinta Perez is arrested and charged. Detective Matt Gunnison, however, is not convinced and with the help of Susan, an ex-nun, he discovers a fascinating link between the priest's death and the death of a child 25 years ago. 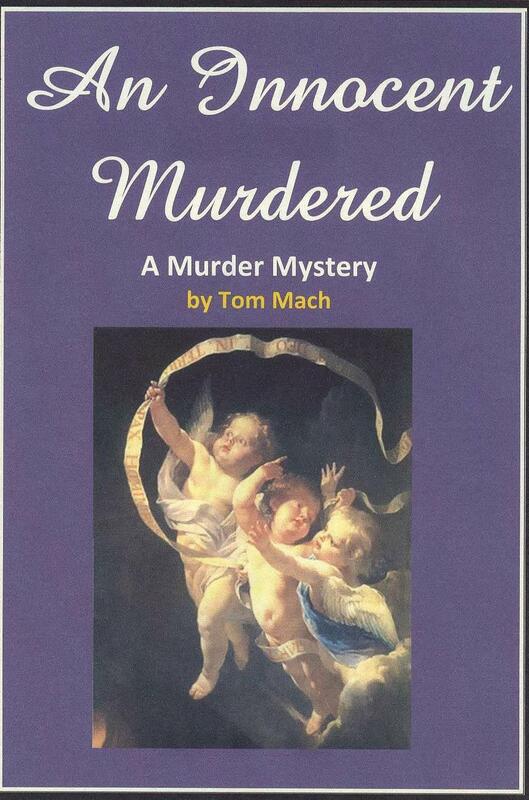 Will Matt be able to solve both murders? 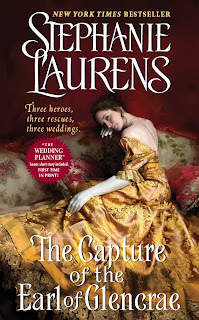 For Leanne, infuriatingly charming firefighter Christian Welton is out of bounds. Not only is he too young for her, but his trail of broken hearts is legendary. Leanne's fought hard to be one of the boys, and won't let anyone see that Christian's smile makes her want to melt into his arms! 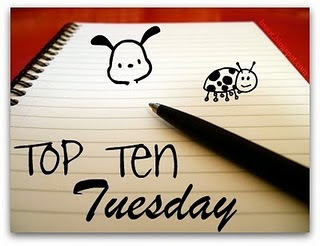 What have you added to your TBR pile this week? 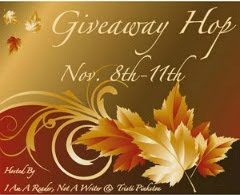 Congratulations to Miranda Grissom, winner of my November Giveaway Hop prize. Thank you to everyone who joined in! It was great fun. I actually won a Nook 3G Classic in an online contest a couple years ago. I'd always wanted one, but couldn't swing the cost (that was before the price wars between Amazon and Barnes and Noble... where we all win!). I was so thrilled because reading eBooks on my computer was hard (I'd often print them off instead, which sort of defeats the purpose of an eBook). While it hadn't replaced print books for me, I do enjoy having one. It's especially nice to get the free downloads from new authors to help me find different things to read that might not have been something I'd have chosen on my own. It's also easier for my to hold. My hands can get stiff and achy sometimes, and the Nook is lighter than a book, plus I bought a cover that works as an easel, so I can sit it on the table and not hold it at all if need be (and the pages don't flip closed!). So, yes, I do enjoy having it. While it may not replace print books, it's convenient and easy and I can even borrow books from the library. 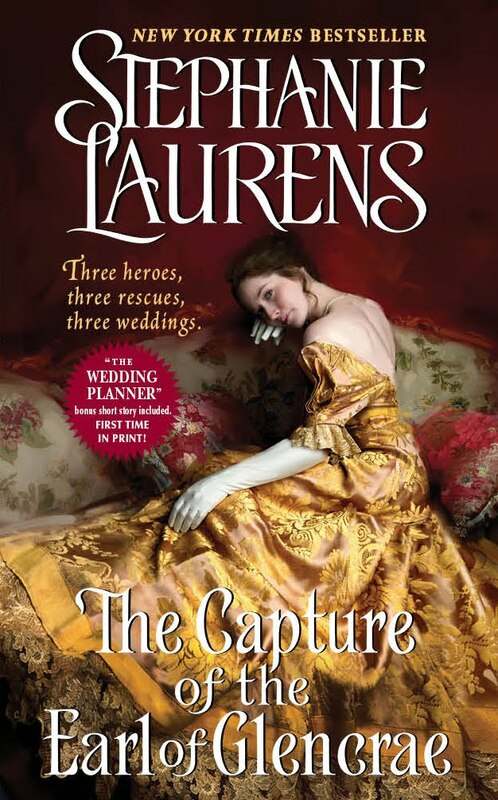 Blurb: Three heros, three rescues, three weddings. ...but not until she and her hero confront a devious enemy and lay to rest an ancient grudge in the Scottish Highlands! Headstrong Angelica Cynster is certain she'll recognize her fated husband at first sight. And when her eyes meet those of a mysterious nobleman across a candlelit ballroom, she knows beyond doubt that he's the one. But her heart is soon pounding for an entirely different reason--when her hero abducts her! The eighth Earl of Glencrae has no choice but to kidnap Angelica, the one Cynster sister with whom he hadn't wanted to tangle. But to save his castle and his clan, he must persuade her to assist him--and he's prepared to offer marriage to seal the deal. If you've been reading the Cynster Sister series, I'm betting that you (like me!) 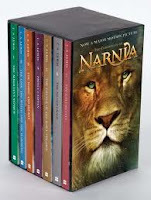 are waiting for this last book. I'm so pleased they are coming out only a few months apart -- I hate waiting a year or more between books. Disclaimer: I am an eclectic reader and there aren't many books I've found that are outside my comfort zone--if a book is TOO far outside my comfort zone, I'll tend to put it down and not finish it. Life's too short to spend on books I'm not enjoying. I did finally manage to come up with some books that left me ...uneasy...after reading them. November Giveaway Hop - Win Prizes! Thanks for visiting my blog! As you can see, I love books in all shapes, sizes, lengths and genres and will be posting reviews, giveaways, interviews and guest blogs, contests and more. To win my giveaway, all I ask is that you follow my blog (make sure your email is associated with your profile). 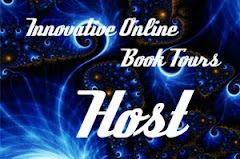 Earn a second entry by leaving me a comment on your favorite author or genre! 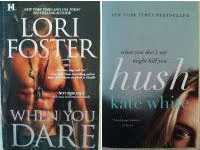 I'm giving away two romantic suspense books (US addresses only please) and a $5 GC to Amazon.com! It gets better though! After you leave here... go visit one of the blogs listed below. Each of these fabulous blogs is hosting a giveaway for something a reader, author or blogger would enjoy (if the link below isn't working, please click on the banner at the top of the post to see the other participants). The Historic hotel in Boonsboro has endured war and peace, the changing of hands, and even rumored haunting. Now it’s getting a major face lift from the Montgomery brothers and their eccentric mother. As the architect in the family, Beckett’s social life consists mostly of talking shop over Pizza and beer. But there’s another project he’s got his eye on; the girl he’s been waiting to kiss since he was sixteen. 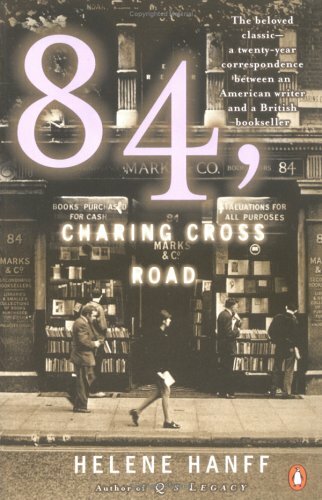 After losing her husband and returning to her hometown, Clare Brewster soon settles into her life as the mother of three young sons while running the town’s bookstore. Though busy and with little time for romance, Clare is drawn across the street by Beckett’s transformation of the old inn, wanting to take a closer look …at both the building and the man behind it. With the grand opening inching closer, Beckett is happy to give Clare a private tour – one room at a time, in between blueprint meetings and kindergarten pickups. It’s no first date, but these stolen moments are the beginning of something that could arouse the secret yearning that resides in Clare’s independent heart – and open the door to the extraordinary adventure of what comes next. This story revolves around the Montgomery family: three men and their mother. As I met each one, I fell in love. They all have distinct personalities and appearances, they're rough and tumble and all man. They're very different from each other, but close knit and obviously a loving family. Our heroine, Clare, is a young widow with three sons and is struggling to handle her emotions and pain. She deeply loved her husband and adores her kids. Her story is handled with love and understanding. Her children are normal, loving, rowdy boys. You can’t help but fall for them. She's a successful businesswoman who knows where her priorities are. Beckett Montgomery has longed for Clare since high school. As an adult, he put those feelings on the back burner and just became her friend, especially after her husband was killed. But lately little electrical currents have started running between them, and all those old feelings have returned in spades. This is definitely another wonderful story by Nora Roberts and illustrates why she's an auto-buy author for me. She has such a talent for bringing her characters to life. You feel as though you are a part of the story. This book is touching, loving, humorous, nerve-wracking in parts and ... just when you think you have it figured out, it changes just enough to keep you interested. There is a ghost in the Inn and a history of the building that goes back 200 years. It’s fascinating to read as it becomes renewed again. I can't wait to see what happens in later books as the ghost becomes even more present. I didn’t want to put this book down, desperate to see how things turned out, but on the other hand, as I read more and more, I kept putting it down, because I didn’t want it to end. I don't want to wait six months for the next installment. In fact, I'm thinking about picking this book up and reading it all over again. I enjoyed it that much.